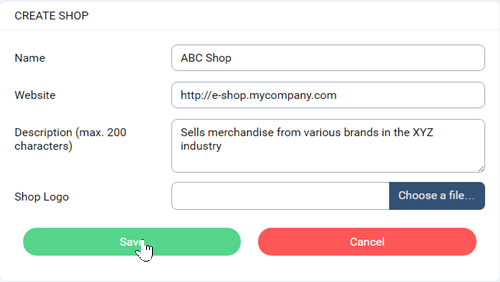 In the web menu, choose Shops in order to create your e-shops and to view existing ones (together with the technical implementation details), or to download the implementation library, technical documentation and M3Pay logo. The latter three are required in order to implement payments with Moneymailme application on your e-shop. Click on Create shop to create a new e-shop. Input a name, your e-shop website and a description of maximum 200 characters. You can also choose an e-shop logo; if you do not choose a logo, we will provide a generic M3 partner e-shop logo for you. Note: The e-shop name, website and logo will appear on the mobile Moneymailme application of the users who pay for an order on your website using M3Pay option, so make sure the information you put is what you want your customers to see. See Management of your M3 orders and payments section for details. After clicking on Save button, you will be redirected to a page that contains technical implementation details of your e-shop. 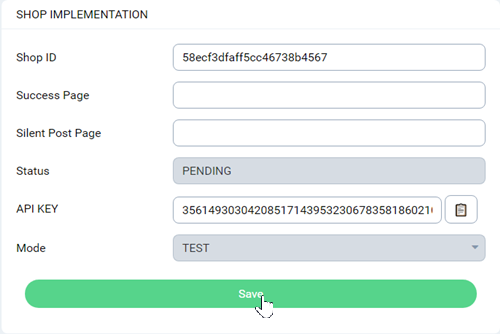 Your e-shop is now in TEST mode; it means you can test as much as you like the implementation of Moneymailme payments in your e-shop until you are ready to go live. When you are ready to pass your e-shop to LIVE mode, three conditions must be met: your documents must be approved (see Documents section), your e-shop must be approved by Moneymailme team (the Status will be PENDING until the e-shop is approved or rejected) and your technical implementation details from the Shop Implementation section above must be filled in. Go to the Tips & Tricks section from this web page in order to download: a technical documentation that explains how to implement an M3 e-shop, the code PHP library to use in your Moneymailme payments in your e-shop and the M3Pay logo. Read the downloaded technical documentation to see how to use: Shop ID and API KEY. Read the downloaded technical documentation to see how to setup: Success Page and Silent Post Page. The Success Page is a web page where a customer is redirected after a successful payment with Moneymailme application. The Silent Post Page is a web page where an answer / confirmation of the payment (with details of the payment) is sent after a successful payment with Moneymailme application. You can change the Shop Implementation data at any time, even if your e-shop mode is LIVE. However, changing the e-shop name, website, description or logo will resubmit the e-shop to Moneymailme team for approval. Note: Go to the Management of your M3 orders and payments section to understand more about the payment process with Moneymailme application. The Shops section displays, as well, a list of your currently created e-shops, together with their status and the option to edit them.